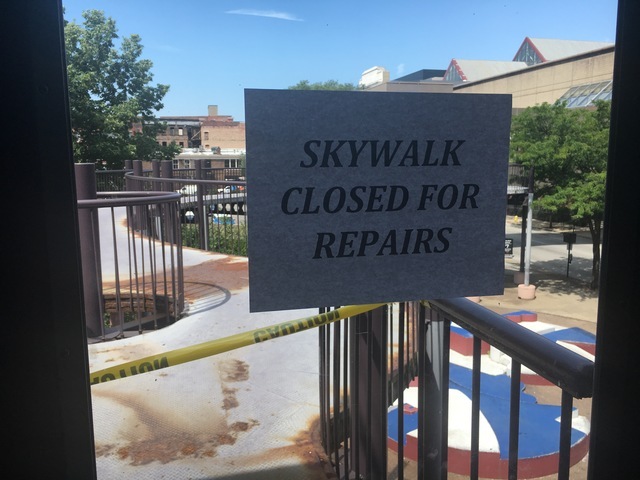 CINCINNATI - The city of Cincinnati shut down a section of the Downtown skywalk near Duke Energy Convention Center this month after inspectors found “deteriorated steel” in the metal platform leading to Convention Place Mall. It’s the latest in a series of legal skirmishes that could lead to an eviction, foreclosure or bankruptcy filing by two companies that control the office building and retail center across from the convention center’s main entrance at Fifth and Elm streets. Owner Ron Goldschmidt said he’ll address the city’s concerns, but declined further comment. With its broken windows and empty storefronts, the building presents an “uninviting” first impression to convention center users, said Hart Productions founder Chip Hart, whose annual boat show and Holiday Market bring more than 60,000 patrons to the center each year. Hart said a city-owned parking garage at Sixth and Elm isn’t much better than Convention Place. The vendors he attracts to trade shows try to steer clear of Millennium Hotel, where city officials have been encouraging renovations for years. Convention Place Mall is an office and retail complex built on city-owned land at 435 Elm Street by developer Harvey Cohen in 1983. Goldschmidt, president of CBD Investments, took control of the office building in 1990. He’s also the managing member of RSJJ Investments, which started leasing the adjoining three-story retail space from the city in 1999. The city is trying to evict both companies in a court case that began in May 2016. U.S. Bank National Association alleged CBD Investments defaulted on a $1.3 million loan. The city filed counterclaims alleging both companies were in default of their lease obligations to the city. In addition, city attorneys argued in a September court hearing that Goldschmidt’s companies were behind on property taxes. 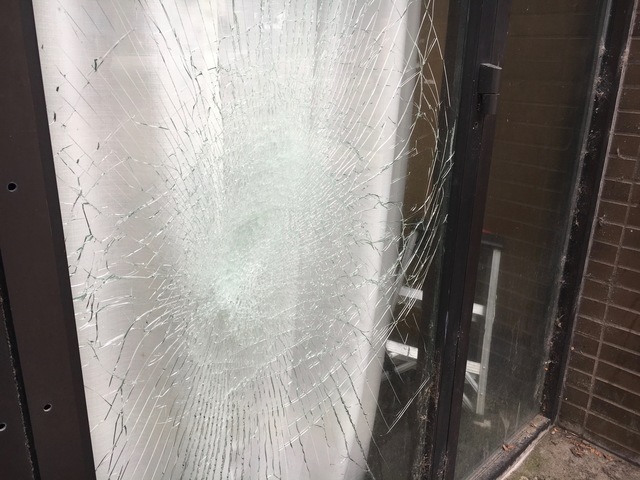 CBD Investments attorney William Fecher told Bachman “there are defenses to the arguments that CBD is in default.” But he added that Goldschmidt would opt for Chapter 11 bankruptcy before allowing the city to evict him from the property. Bachman ruled Dec. 8 that the city was entitled to terminate its leases with both entities. But that ruling isn’t final until a Hamilton County Common Pleas judge accepts it. The case has been reassigned to three different judges since last November, when the original judge on the case, Beth Myers, left the Hamilton County Court of Common Pleas bench for a seat on the Hamilton County Court of Appeals. Hamilton County Common Pleas Judge Robert Winkler was assigned the case May 16, but hasn’t decided what next steps to take. 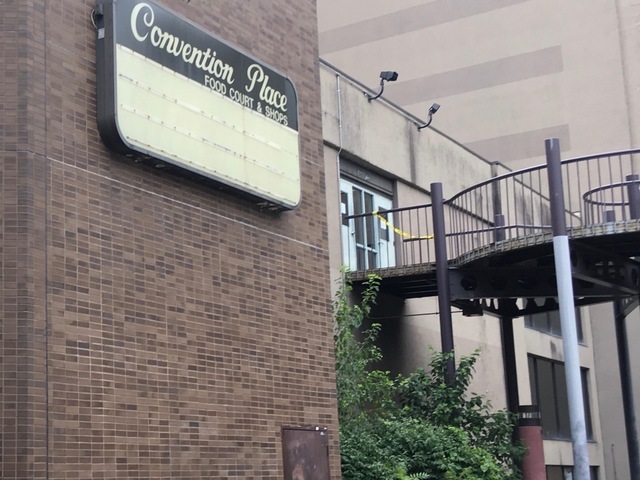 In the meantime, city inspectors have turned their attention to the rusty metal walkway that connects the southeast corner of the convention center to Convention Place Mall – providing a second floor path for Hyatt hotel residents to make their way to convention events. The problems at Convention Place could be solved with the creation of a “convention district” that includes an eastward expansion of the existing center into the block that now holds the Millennium Hotel, said Mike Laatsch, chief operating officer of the Cincinnati USA Convention and Visitors Bureau. But trade show producer Chip Hart said the hard times at Convention Place are proof that “conventioneers don’t spend the money that everybody says they do.” His solution would be relocate U.S. Bank Arena to the blocks south of the existing center, including the Convention Place site. Hart is a longtime critic of the convention industry, which competes with his trade shows for booking slots. His argument: Even if Cincinnati expands its 750,000-square-foot center, it’ll likely fall short of the 1.3 million square feet available in Indianapolis, 1.8 million in Columbus and 2.2 million in Cleveland. “They can’t build a place big enough in Cincinnati to bring the kind of conventions they want,” Hart said.